We have a dinner rhythm to most every week. Thursday nights are pizza night while Friday’s are often leftover vegetables tossed with pasta. Sometime earlier in the week is taco night. We make up guacamole and make homemade tacos or enchiladas. It may be one of my favorite dinner nights. These black bean tacos are an easy base when I need a quick dinner. These cooked black beans are a staple. I use them as I would refried beans, in everything from these tacos to black bean bowls. Just a few beans and spices- so quick and easy. 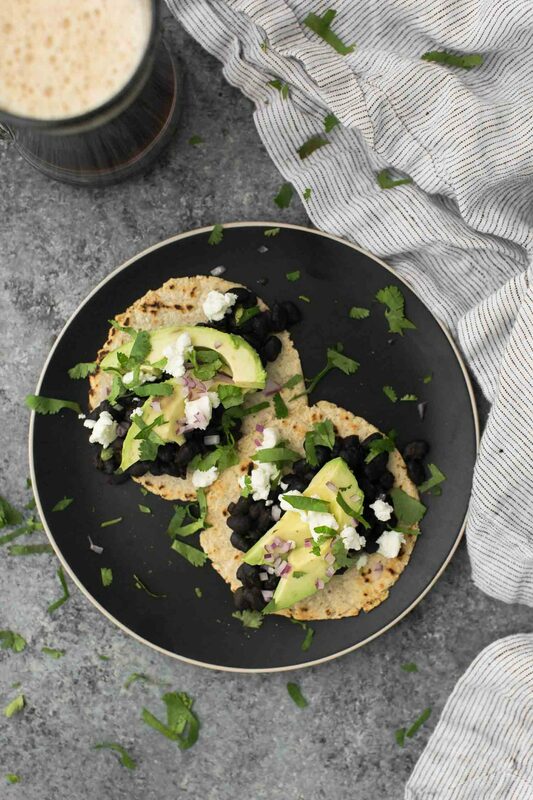 Easy and fresh black bean tacos made from black beans and an easy spice blend then topped with fresh cilantro, avocado, and goat cheese. Place a small pot or skillet over medium-low heat. Add the olive oil followed by the minced garlic. Cook for 1 to 2 minutes, just to until the garlic begins to brown. Place beans and liquid in a pan with the cumin, coriander, garlic powder, and chili powder. Heat over medium-low heat until the majority of the liquid has been absorbed. Taste and add salt as needed. Heat the tortillas until soft and cut the avocado into slices. Assemble the tacos with ¼ of the bean mixture, a few slices of avocado, a sprinkle of goat cheese, and desired toppings. Tips & Tricks: The original recipe called for grilling the avocado (this version can be found here). I’ve found over the years that it wasn’t worth making another pan dirty. This new version reflects the updated, easier recipe. I recommend making your black beans from dried beans and storing in the cooking liquid. 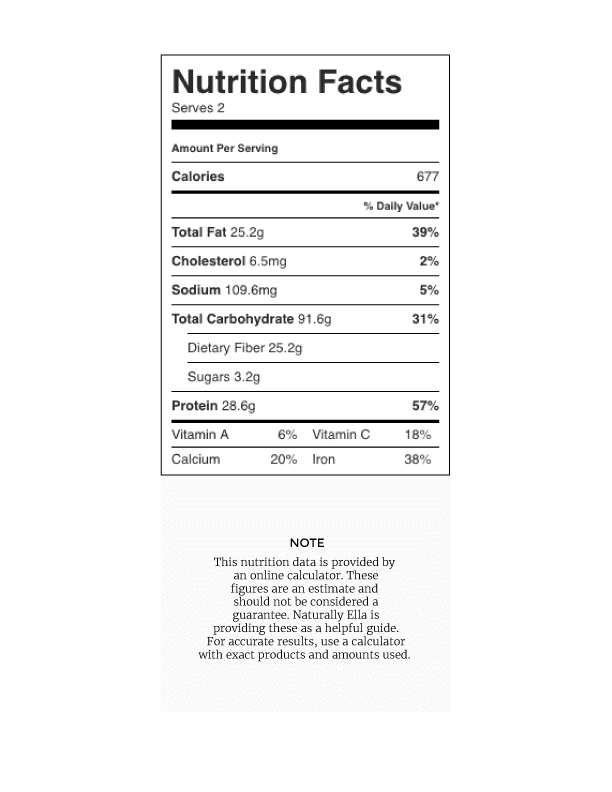 It’s easier to control the sodium amount and flavor of the beans. These black bean tacos have been a staple in our weeknight dinners for years. The beans serve as an easy base for many other flavors, vegetables, and meals. This particular recipe is as about as simple as I go. Legumes, spices, and a fresh topping- you really can’t go wrong! Lentils: If you don’t want to use black beans, cook black, brown, or green lentils with the spices listed above. Greens: Add lettuce, arugula, or spinach to your tacos for an extra boost of greens. Flavors: These beans make for wonderful quesadillas, enchiladas, or tostadas. 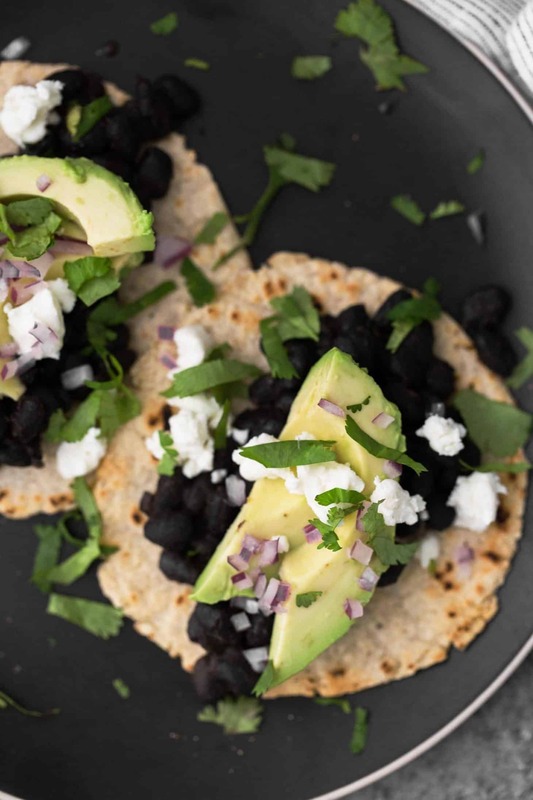 These black bean tacos are just the beginning of what you can do! 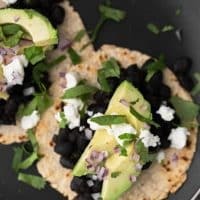 Vegan: Leave the goat cheese out- these tacos are still great! In my book, the tortillas are just as important as the taco. Most store-bought brands are flavorless and have a texture I often find lacking. 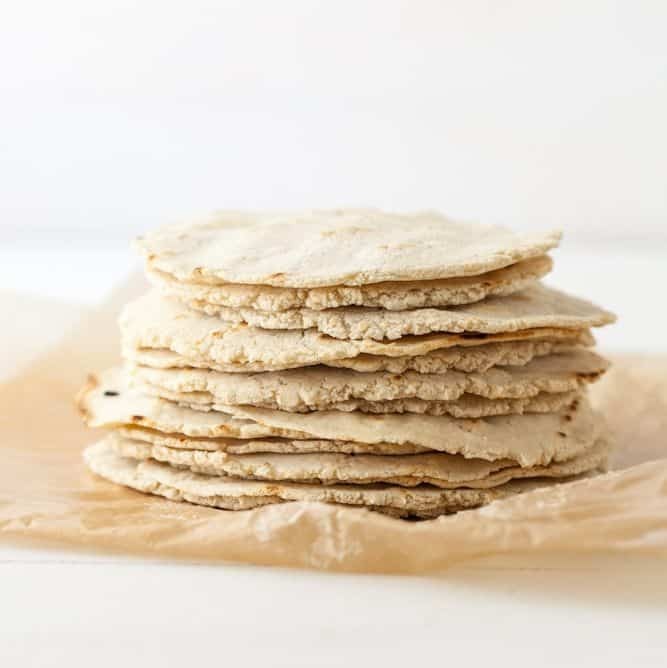 There are some decent store brands (I like Mi Rancho’s organic corn) but I find making my own tortillas easy and therapeutic. Easy recipe with protein and good fat from the Avocado! Excellent! So good, especially with the honey lime sauce! You say about making your own tortillas. Do you have a recipe? (Vegan) Every time I’ve tried they’ve always been to dry & not pliable. I swear by this recipe– the key, I’ve found, is to wrap them in a damp towel after and reheat in a damp towel (in a low-heat oven). Without the dampness/heat, the tortillas aren’t very good! Chili powder as in spice blend or cayenne pepper? saw this on your front page, have been looking for more legumes recipes and this works wonderfully, thank you!